I changed the gauge of these to 6.5 sts. per inch and knit the small size in an attempt to make them fit at the same time as the matching baby pants made earlier. According to this shoe size guide, I seem to have hit the 6 month nail on the head. Hooray! Other than the yarn/gauge, I didn’t change a thing. There are a lot of seams in this, though, and as I knit the second, I pondered if it would be worth changing the pattern to knit in the round. I am so totally not familiar enough with babies and at what age they start standing, but that seam down the center of the sole might be a good thing to dispense with. These could be cast on at the center sole (as in the pattern), but with the Figure 8 Cast On and knit in the round. The only drawbacks to this are speed (because these knit up very quickly flat) and purling a row every other row. The finishing might cancel out any speed gained with knitting flat. I think I’ll make a pair to match the Sweet Baby Hat and knit them in the round. Good News: Another friend is pregnant. That makes two more BSJs I can make! These are beyond cute! seriously! The buttons are wonderful and I can’t get enough of herbal yarn. So precious! I especially love the buttons; they’re such a nice touch and really complement the yarn. holy cuteness! seriously adorable. that will be one stylin’ babe! Totally delightful! And oh my, those buttons are perfect. what a lovely set! I’d say make them adult size! its a shame to use these awesome buttons on the small size. (they do out grow them so fast. what a lot of knitting you have going on. and lovely too. if only one had more knitting time. and you are embarking on the saddle shoulder aran too. so am i. jared’s is breathtaking and i ordered the yarn from webs sometime in april. unfortunately so many other projects demands my time. having a big family i have to be fair and knit for everyone which means i knit the last sweater for me in ’89. put on a shelf for everyone to see and admire! I actually squealed when I saw these. So cute! I want to have another baby just so I can knit thousands of these and put them on my baby’s feet. holy cuteness! oops, that’s already been said. These are far too adorable for words. It should be illegal to make things this cute. I love these bootees – I love the way the colors of the yarn work with the rustic look of the buttons. Makes me wish I had a baby for which to knit. Makes me wish for a baby – me scared, going to go get a cool glass of water to chill. PS. Some of the blog links to the left are dead links and a few lead to odd commercial looking sites. Thought you may want to know. I was checking them all out as I watched Hot Fuzz and stopped to giggle frequently. So, so, SOOO cute. The buttons are amazing. I would have to say, from watching my babies, that a seam down the middle of the sole wouldn’t bother a baby much at all. Some babies love to push their legs out and stand supported, even from a very young age–but even so, it’s not the same as walking in the booties. I really don’t think the seam would be irritating unless you’ve got a walking prodigy. My babies didn’t stand for any significant length of time until they were 9-10 months. I just love how these came out – I made a pair with the bottom 2/3’s in a “sample” that you sent along of fat sock and got a ton of compliments over at ravelry and on my blog – and I have just gotten some more fat sock to make another pair:) And am hoping for still more:) Love the herbal colorway! You know, I had exactly the same thought as I was making a pair of these lately. And went through exactly the same list of pros and cons to making them seamless that you just did. In any event, your booties are precious, and what a cool sort of rustic button, too. Lucky baby! Those may be the cutest thing I’ve ever seen. And the buttons are sooooooo perfect! I also love your palette because it doesn’t fall into the typical “baby” colors. Very inspiring. Babies generally start walking around a year, give or take, so seams in the six month size wouldn’t be too bad–outside of the aesthetics. Would it be nuts to make a pair with no child in mind, just my wish to knit something that cute? I’ve seen these everywhere, but yours are definitely the cutest I’ve seen. Love the yarn and the buttons. If knitting in the round works, please share what you do. I hate all the seaming! So cute! These are definitely going on my “to-Knit” list for my sisters upcoming baby! I have this pattern printed off and will probably cast on a pair this week. I’ve wondered about the seam too. Though most babies don’t stand until 10ish months or up, I wouldn’t see the seams as a problem. But I hate sewing seams. I’ve thought about altering the pattern to be more like Christine’s stay on booties (knit the sole flat, then pick up stitches all the way around and knit in the round, short row toe and so on. 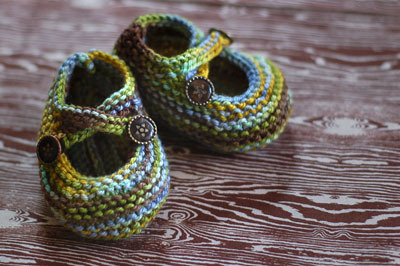 Those are absolutely the most beauteous baby booties I’ve seen…lovely color, great buttons! You go! They turned out great, I love all the colors. Fabulous! I am crocheting a baby blanket for my cousin and these would be a fabulous addition (if I don’t get that weird, over committed thing happening where I don’t get anything done). Fantastic! They are way too cute. These work so perfectly with your yarn! Mind if I link to them? Oh my, I’ve really got to make a pair of these. Your choice of buttons is perfect! !